Choisir votre date d'arrivée, nombre de nuits et le nombre de personnes. Les détails de l'appartement apparaissent avec le prix1 fixé de maniere précise pour le séjour de chaque personne, de chaque jour choisi. Recommended for guests using wheelchairs - no stairs on the way to the elevator. Recommended for guests who plan using bikes/motorbikes in Krakow - big courtyard to keep them safe. The flat has two bedrooms with ample space for clothes and storage. The sizeable living room with 42in TV and lots of international channels can also be used as a further double room. The kitchen and bathroom are both a good size and have been finished with carefully chosen modern fittings throughout. Our apartment boasts wonderful views over a traditional square in The Jewish Quarter. Everything you could possibly need is within easy reach. There are an abundance of diverse restaurants (including Thai/Japanese one in the building ) to suit every taste alongside local markets, bars and local landmarks. Dear Guests - all reservations made for 25 - 31.07.2016 must be fully prepaid within 1 week of the booking. The John Paul II International Airport is located to the west of Cracovie, at a distance of 11 km from the city centre. PUBLIC TRANSPORT - The bus stop is located directly at the roundabout, in front of the passenger terminal. Take bus no.292 to Dworzec Glowny Wschod. Travel time approximately 45 min. Bus fare 4 PLN. Tickets may be purchased at newspaper stands in the passenger terminal and from the driver (with an additional payment). 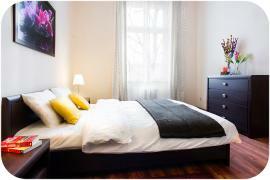 Located in the city center - 1,5 km from the Main Market, link Cracovie with all the major cities in Poland.